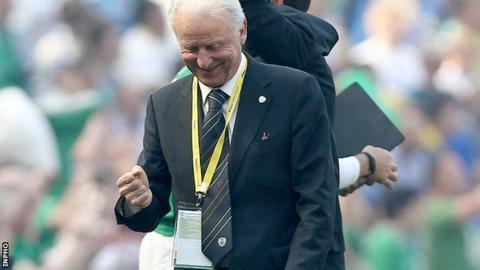 Republic of Ireland manager Giovanni Trapattoni was delighted by his team's display as Shane Long's goal helped them beat Bosnia-Hercegovina in the warm-up friendly ahead of Euro 2012. "They left me very satisfied and not only because of the result," he said. "There was a very good approach and many performances were very good. "I saw [Aiden] McGeady and [Damien] Duff are in top condition. It was also important for me to see [James] McClean and to give him confidence." McClean was handed his first start and produced a lively opening half for the Irish. However, the emerging Sunderland star was overshadowed in the second half by McGeady who was named man of the match after coming on at the interval. "They [McGeady and Duff] only played one half because I have to preserve these performers. They are fantastic. Republic of Ireland captain Robbie Keane says a feelgood factor is surrounding the squad ahead of Euro 2012. "But it was important to give McClean the opportunity to play with the team. [Darron] Gibson played a fantastic game and Jonathan Walters is now a good option. "Shane Long confirmed his quality. It's important we go to Poland confident about what we can do." Goalscorer Long believes that the win will boost Republic confidence ahead of their Euro 2012 challenge. The West Brom striker's 78th-minute header secured a 1-0 win and Sunday sees Trapattoni's squad depart for their pre-tournament training camp in Montecatini, Italy. "The gaffer put me on to get the winner and luckily I was on the end of a brilliant Aiden McGeady cross," said Long. Asked how important victory could be psychologically, Long said: "It's massive. "We joined up on Sunday and we wanted to get off on a good foot today and get a bit of a roll going before we go to Poznan [Ireland's Euro 2012 base]. "We go on to Hungary on June 4 and we'll try to get a win there and get a bit of confidence going. "The whole country's getting right behind us. They're all coming over to support us. Hopefully we'll give them something to shout about." The win extended the Republic's unbeaten run to 13 games and came against a team Trapattoni selected because of their similarity to Euro 2012 opposition Croatia. "It was tough but we're glad with the win," said McGeady. "Bosnia had a few chances in the first half but in the second half we got chances ourselves and it could have been three or four." Richard Dunne came off in one of six Trapattoni substitutions and he lauded McGeady's contribution. "I was just tired in the sun. It's so hot, it takes it out of you," said the Aston Villa defender. "Today was good. When Aiden came on he changed the game and really opened them up. "The atmosphere among us is really good. To win games obviously builds that."